Large squares, alternate brown check and blue check, of men's dressing gown material. "Everyone's father had one in 40s and 50s". [Pam Clifford]. No padding. Backing is smaller random shapes of men's grey suiting material. Machine construction. There is no quilting. Maker unknown. Purchased by the present owner from a St. Vincent de Paul shop for $3 ten or more years ago. Centre medallion of hexagons surrounded by blocks of tumbling blocks. Rows of triangles around the edge. Each corner has a star within a hexagon. Hand stitched with the traditional 20 stitches to the inch. There is a silk tassle in each corner. Materials include: silk, silk ribbon, taffeta, brocade, velvet, striped silk, faille. The backing is cream holland. 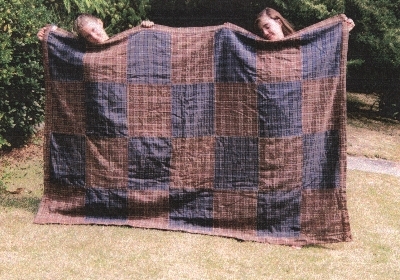 Patchwork quilt made from pure wool suiting samples in shades of navy blue and brown. 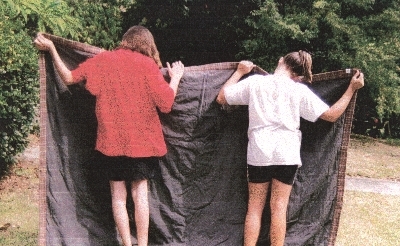 Quilt is constructed in 11 rows containing 11 pieces. Each piece is 14cm x 9cm. No padding. Backing is of mauve cotton with a floral pattern of closely spaces white/pale mauve flowers. Patchwork quilt made from brightly coloured printed cotton fabrics in hexagon patches hand sewn together in rosettes, and stitched by machine onto a border of green moire taffeta. No padding. Backing is green cotton satin curtain lining. There is a matching pillow sham. Quilt No.436PCS - Port Curtis Historical Soc.Inc. Cotton Hexagon quilt with a wide variety of patterned and plain materials. Blue binding and a cotton backing. The padding is thought to be cotton wool. Patchwork cot quilt made from hexagons 63mm across in a variety of cotton prints and plains. The bright coloured patches came from children's clothes and dressmaking scraps. No padding. Backing of unbleached calico. Hand sewn.